Intelligence tests are psychological tests that are designed to measure a variety of mental functions, such as reasoning, comprehension, and judgment. The goal of intelligence tests is to obtain an idea of the person's intellectual potential. The tests center around a set of stimuli designed to yield a score based on the test maker's model of what makes up intelligence. Intelligence tests are often given as a part of a battery of tests. There are many different types of intelligence tests and they all do not measure the same abilities. Although the tests often have aspects that are related with each other, one should not expect that scores from one intelligence test, that measures a single factor, will be similar to scores on another intelligence test, that measures a variety of factors. Also, when determining whether or not to use an intelligence test, a person should make sure that the test has been adequately developed and has solid research to show its reliability and validity. 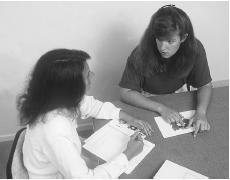 Additionally, psychometric testing requires a clinically trained examiner. Therefore, the test should only be administered and interpreted by a trained professional. A central criticism of intelligence tests is that psychologists and educators use these tests to distribute the limited resources of our society. These test results are used to provide rewards such as special classes for gifted students, admission to college, and employment. Those who do not qualify for these resources based on intelligence test scores may feel angry and as if the tests are denying them opportunities for success. Unfortunately, intelligence test scores have not only become associated with a person's ability to perform certain tasks, but with self-worth. Many people are under the false assumption that intelligence tests measure a person's inborn or biological intelligence. Intelligence tests are based on an individual's interaction with the environment and never exclusively measure inborn intelligence. Intelligence tests have been associated with categorizing and stereotyping people. Additionally, knowledge of one's performance on an intelligence test may affect a person's aspirations and motivation to obtain goals. Intelligence tests can be culturally biased against certain groups. When taking an intelligence test, a person can expect to do a variety of tasks. These tasks may include having to answer questions that are asked verbally, doing mathematical problems, and doing a variety of tasks that require eye-hand coordination. Some tasks may be timed and require the person to work as quickly as possible. Typically, most questions and tasks start out easy and progressively get more difficult. It is unusual for anyone to know the answer to all of the questions or be able to complete all of the tasks. If a person is unsure of an answer, guessing is usually allowed. In general, intelligence tests measure a wide variety of human behaviors better than any other measure that has been developed. They allow professionals to have a uniform way of comparing a person's performance with that of other people who are similar in age. These tests also provide information on cultural and biological differences among people. Intelligence tests are excellent predictors of academic achievement and provide an outline of a person's mental strengths and weaknesses. Many times the scores have revealed talents in many people, which have led to an improvement in their educational opportunities. Teachers, parents, and psychologists are able to devise individual curricula that matches a person's level of development and expectations. Intelligence tests are psychological tests that are designed to measure a variety of mental functions, such as reasoning, comprehension, and judgment. Intelligence tests are often given as part of a battery of tests. aspects of intelligence. Another problem with a single score is the fact that individuals with similar intelligence test scores can vary greatly in their expression of these talents. It is important to know the person's performance on the various subtests that make up the overall intelligence test score. Knowing the performance on these various scales can influence the understanding of a person's abilities and how these abilities are expressed. For example, two people have identical scores on intelligence tests. Although both people have the same test score, one person may have obtained the score because of strong verbal skills while the other may have obtained the score because of strong skills in perceiving and organizing various tasks. Furthermore, intelligence tests only measure a sample of behaviors or situations in which intelligent behavior is revealed. For instance, some intelligence tests do not measure a person's everyday functioning, social knowledge, mechanical skills, and/or creativity. Along with this, the formats of many intelligence tests do not capture the complexity and immediacy of real-life situations. Therefore, intelligence tests have been criticized for their limited ability to predict non-test or nonacademic intellectual abilities. Since intelligence test scores can be influenced by a variety of different experiences and behaviors, they should not be considered a perfect indicator of a person's intellectual potential. The person's raw scores on an intelligence test are typically converted to standard scores. The standard scores allow the examiner to compare the individual's score to other people who have taken the test. Additionally, by converting raw scores to standard scores the examiner has uniform scores and can more easily compare an individual's performance on one test with the individual's performance on another test. Depending on the intelligence test that is used, a variety of scores can be obtained. Most intelligence tests generate an overall intelligence quotient or IQ. As previously noted, it is valuable to know how a person performs on the various tasks that make up the test. This can influence the interpretation of the test and what the IQ means. The average of score for most intelligence tests is 100. Matarazzo, J. D. Wechsler's Measurement and Appraisal of Adult Intelligence. 5th ed. New York: Oxford University Press, 1972. Sattler, Jerome M. "Issues Related to the Measurement and Change of Intelligence." In Assessment of Children: Cognitive Applications. 4th ed. San Diego: Jerome M. Sattler, Publisher, Inc., 2001. Sattler, Jerome M. and Lisa Weyandt. "Specific Learning Disabilities." In Assessment of Children: Behavioral and Clinical Applications. 4th ed. Written by Jerome M. Sattler. San Diego: Jerome M. Sattler, Publisher, Inc., 2002. Firstly, i really like this page. it gives me a lot of information that i need it most for my assignment. i think there should be more explanation and examples for this section. but i love this page so much because it helps me so much.